Feel like you are herding cats when trying to manage a vast number of information security vulnerability action plans and keep up with the many milestones that they establish? Actually, that is exactly like herding cats and its a tough job. To help, OCEG and sponsor RSA have produced a new Playbook for government agencies and contractors, as well as those in the private sector, who face the challenges of keeping on top of defects and correcting them in budget and on time. There are many challenges that arise from budget constraints, siloed operations across departments, redundant systems and ever changing requirements. The benefits of rising to these challenges, however, go beyond mere regulatory compliance. Organizations that establish a common base of process and use common technology to manage security get a broader view, enable faster sharing of information, and gain agility. The availability of tools that allow you to build an integrated approach to assessment and authorization of new information systems, continuous monitoring and overall risk management is a game changer that enhances the organizations ability to achieve Principled Performance. 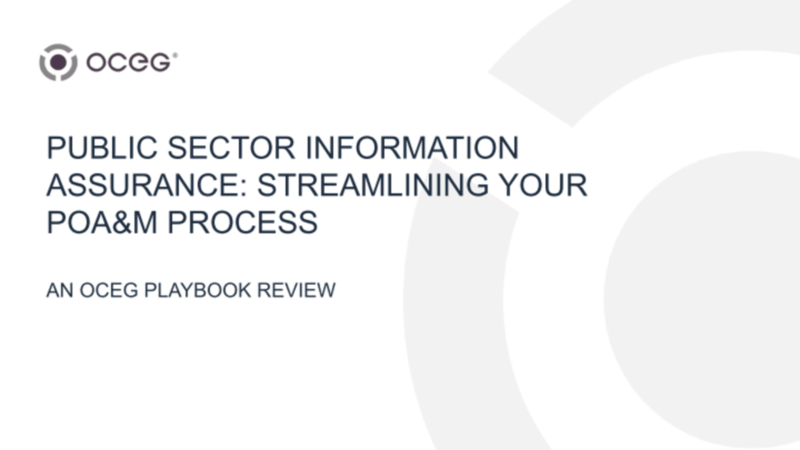 We have emailed instructions to access Public Sector Information Assurance: Streamlining Your POA&M Process – An OCEG Playbook Review Slide Deck to . Make sure the email arrives in your inbox: either add "support@oceg.org" as a safe sender to your email platform, or if you use Gmail, drag our email into your Primary tab.